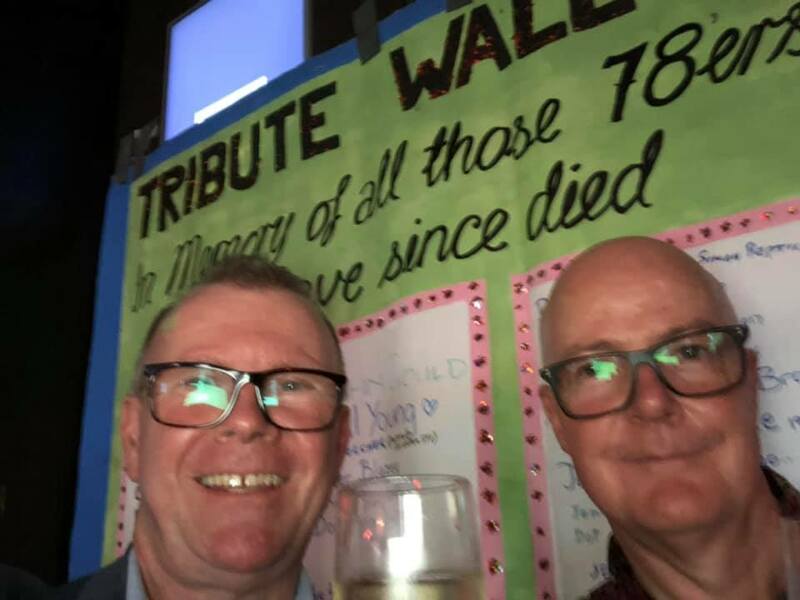 A contingent of 78ers traveled to Wagga Wagga to attend the inaugural Wagga Wagga Mardi Gras in March, an event that aims to raise the visibility of the lesbian, gay, bisexual, transgender, queer and intersex communities in the Riverina. It was great to see a big roll-up for the event and we enjoyed mixing with locals and other visitors supporting the region after the Parade. Look out for us at the end of the month as we head to the Hay Mardi Gras, part of the Rainbow on the Plains Festival 29-31 March! The 78ers had a great time in the Mardi Gras Parade on Saturday March 2nd, 2019! Thanks to Robert French for the first photo below, and William Brougham for all the other photos below. Many thanks to William Brougham for the video of Mother Inferior’s song. Mother Inferior’s songsheet is provided below so those at home can sing along. 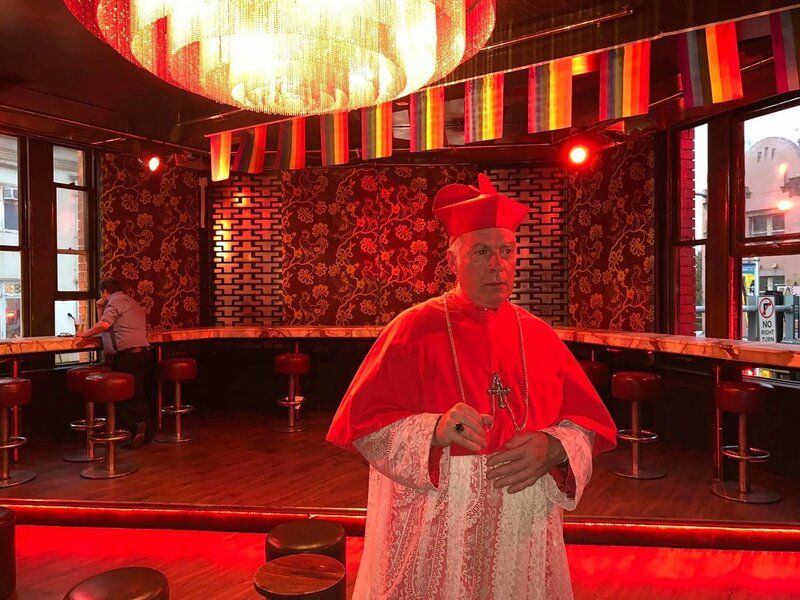 Mother Inferior (aka Fabian LoSchiavo) sings 'Song for 78ers' with the Mardi Gras 78ers last night at their event at the Colombian Hotel to mark the Sydney Gay and Lesbian Mardi Gras. Good roll up and enthusiastic response to our wonderful speakers at yesterday’s forum Salon78: Rainbow Immigration and Refugees. Thanks to speakers Betty Hounslow, Ken Davis, Mitchell Skipsey and Tina Dixson and chair Garry Wotherspoon. And thanks to attendees including those from the Asylum Seekers Centre, Amnesty International, Teachers for Refugees and the STARTTS Program. The event was recorded and is available to view in full on YouTube by clicking here, or is included below. Thanks to William Brougham for the video. 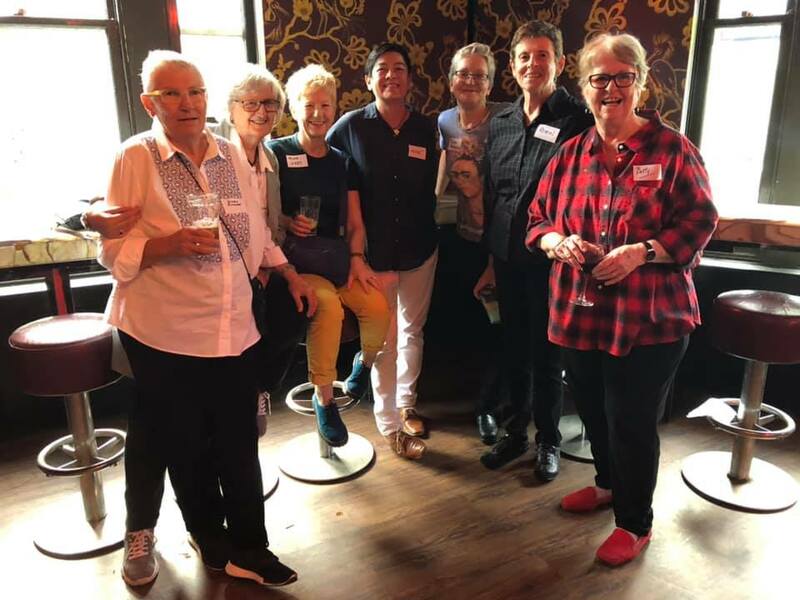 The Gay and Lesbian Immigration Task Force, in which some 78ers were key movers in the 1980s, assisted overseas partners of LGBTIQ Australians to migrate here. Speakers include Betty Hounslow, Ken Davis, Mitchell Skipsey and Tina Dixson. Today, our community is outraged by the plight of LGBTIQ refugees and people seeking asylum. 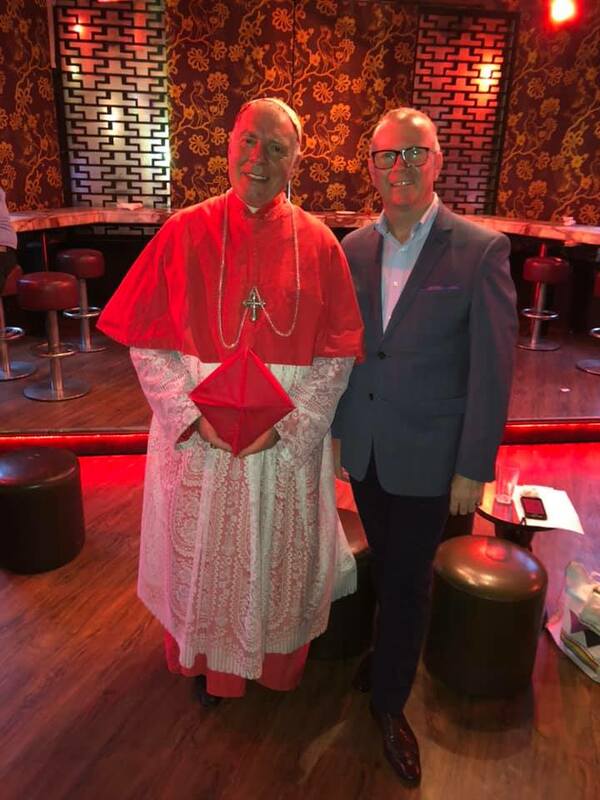 Reunion 41 will be held at the Colombian Hotel again on Wednesday 27th February, 5.00pm-8.00pm, with a special blessing by Mother Inferior. All 78ers and partners or guests are welcome to attend. 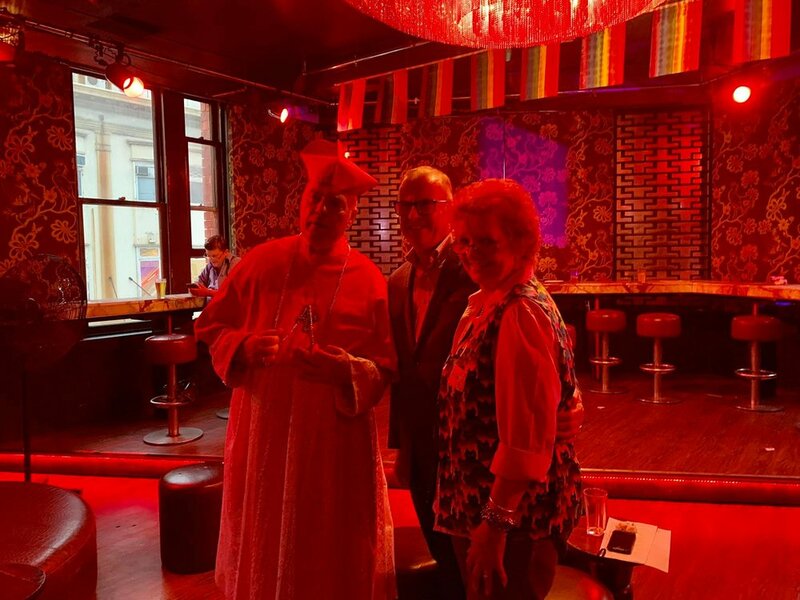 In 2018, First Mardi Gras held a special pre-Mardi Gras Parade 40th Anniversary event for 78ers and guests. This get together, Reunion 41, is on again this year. All 78ers and partners or guests are welcome to attend. If you are joining us for Reunion 41, please RSVP to info@78ers.org.au for catering purposes. If you require lift access, please email us with an approximate time of arrival. The 78ers Parade T-shirt will be available to pick up at Reunion 41. Otherwise, it will be available at the 78ers Parade assembly area. Today, 78ers are outraged by the plight of LGBTIQ refugees and asylum seekers. 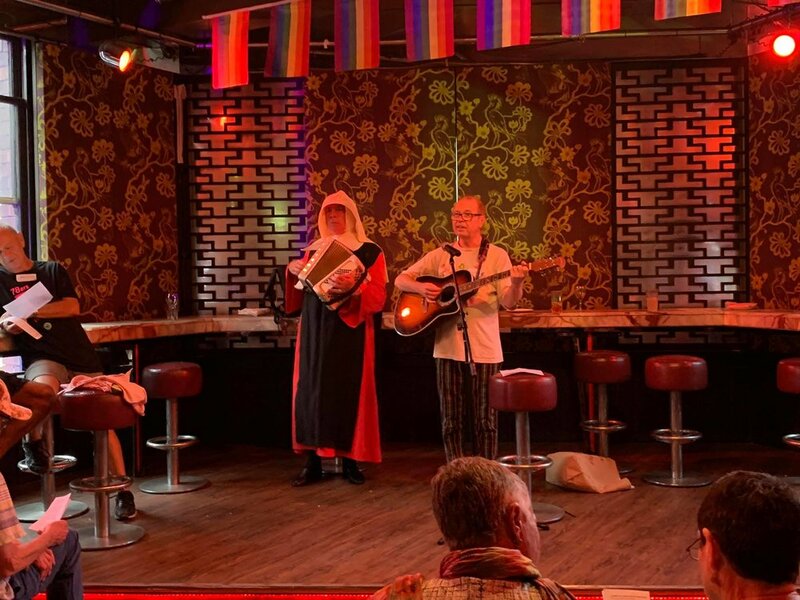 Come along on Sunday February 10, 2019 to Salon78 presents Rainbow Immigration and Refugees and hear about services and campaigns to support these vulnerable members of our community. Salon 78 presents Out and Loud - The Gay Liberation Quire (1981 - 1987) at the Beresford in Sydney. 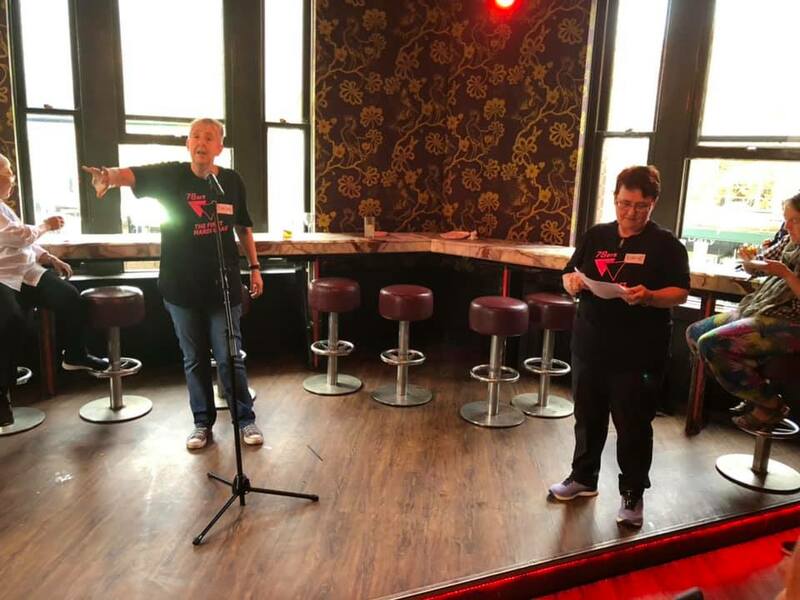 The event took place on the 9th of December 2018 and was organised by First Mardi Gras Inc. This video presents an afternoon of performance and reminiscence with members of the original Gay Liberation Quire. Thanks to William Brougham for both these videos of the event. Event: 9 December 2018 - Salon78 presents out and loud by First Mardi Gras Inc. 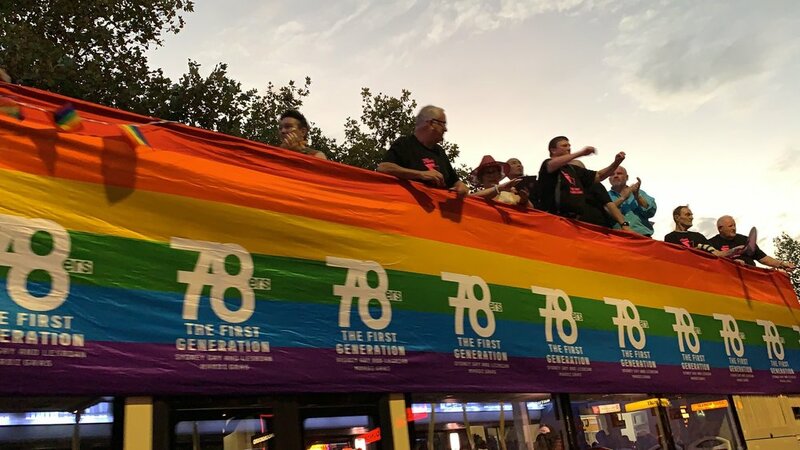 The 40th Anniversary of the first Sydney Gay and Lesbian Mardi Gras is not only about the night of 24 June 1978, it also recognises the massive Drop the Charges Campaign that followed. 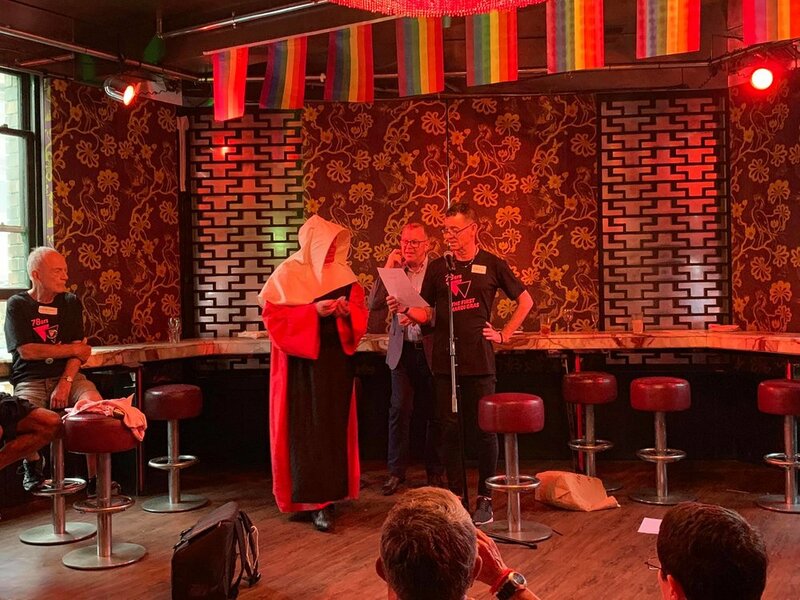 Forty years later we have achieved a lot, but LGBTIQ people in many countries are still fighting for their rights. 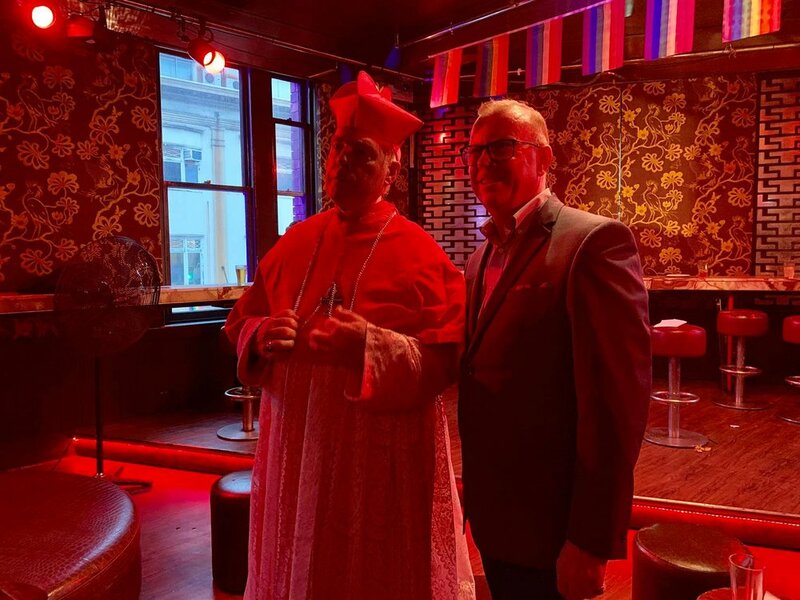 In the forty years since the first Mardi Gras many gains have been achieved but LGBTQI people in many countries are still fighting for their rights. At this FREE special event on Sunday August 26 2018, 78ers reflect on the social and political context of the first Mardi Gras and its impact. 78ers showed off their killer dance moves at Red Raw on Saturday 10th February at the AB Hotel Glebe. There was plenty of action on the dance floor as patrons got into music from the 70s, 80s and 90s. A fundraiser raffle was also held with the lucky winners walking away with a range of prizes including artworks, challenging boxed quiz game Question Time and mint condition LPs from 80s girl bands Stray Dags and Sticky Beat. 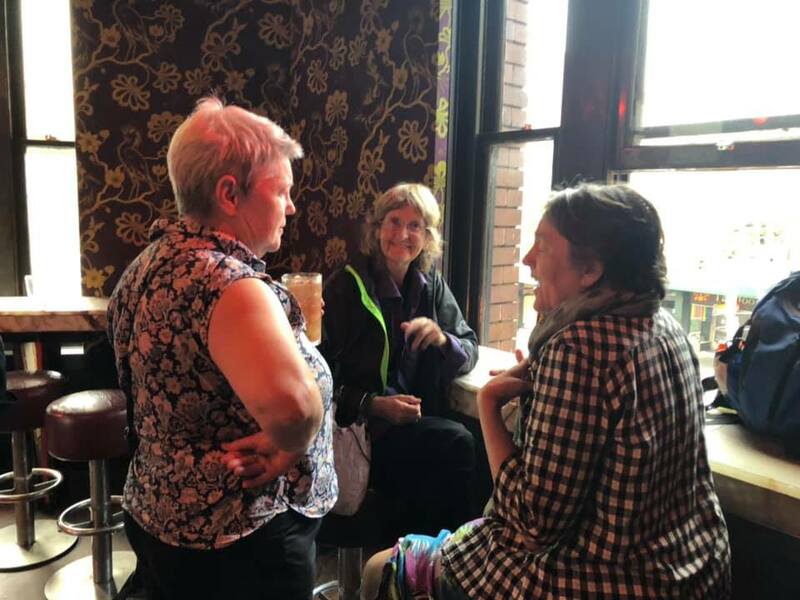 First Mardi Gras is pleased to report that the fundraiser Trivia Night held on Monday 5th February at the Bank Hotel, Newtown was a huge success. Over 100 people attended the event, with teams competing for the major prize, a Dirty Dozen brewery tour sponsored by Young Henrys. The team prize was won by the Young Ones but there were plenty of fabulous raffle prizes also won. Raffle prizes included a framed original linocut, tickets to the Brandenburg Orchestra, Sydney Symphony Orchestra, Australian Museum, Art Galley and Dendy Cinemas. Funds raised will be applied to supporting low income 78ers travel to Sydney for the 40th Anniversary and contributing to staging of 78er Anniversary events. There were many requests for a repeat trivia night so watch this space! First Mardi Gras has received a $6,000 grant from the City of Sydney Council to stage 40 Years of Queer Art: Rebellion and Subversion. The Exhibition will run for two weeks during the 2018 40th Anniversary Mardi Gras Festival. See 40th Anniversary on this website for more details. A Yes rally will be held at Parramatta on October 29 at 11.30am outside of the Parramatta Town Hall. It will then march to the annual Pride Picnic on the Parramatta River Foreshore.